In this area of the Apparel Search fashion brand directory, you will find women's fashion brands from leading apparel companies and fashion designers. On this particular page, you will find information regarding women's clothing with the Missoni brand. 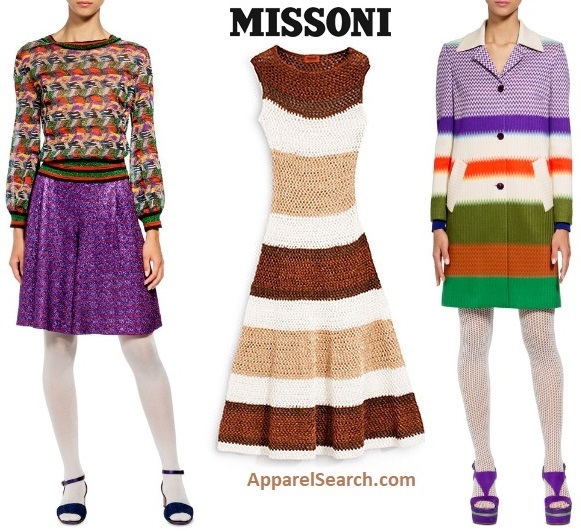 You are welcome to utilize this section of our clothing guide to review Missoni news, Missoni blog posts, Missoni photos, and more. Missoni is a high-end Italian fashion house based in Varese, and known for its colorful knitwear designs. The company was founded by Ottavio and Rosita Missoni in 1953. The business was founded in 1953, when Ottavio and Rosita Missoni set up a small knitwear workshop in Gallarate. They presented their first collection under the Missoni label in Milan in 1958. Missoni is now one of the best representatives of Italian fashion and design excellence around the world. With its pioneering multicolored aesthetic vision, it continues to influence the contemporary lifestyle. Learn more about the women's Missoni fashion brand. If you have changed your mind and do not wish to research the brand Missoni, you can use the search engine on this page to find another clothing label that may be of more interest. Apparel Search is a leading guide to fashion, style, clothing, glam and all things relevant to apparel. We hope that you find this Missoni page to be helpful.